In a totally unexpected turn of events (yeah, right!) Internet Explorer handles legends differently from other browsers. From experimentation, it seems that Internet Explorer treats legend elements as if they’re inside the fieldset, while other browsers treat them as if they’re outside the fieldset. I’m not saying that any browser’s wrong, but we have to circumvent these differences somehow, and creating a separate IE style sheet seems to be the best solution. 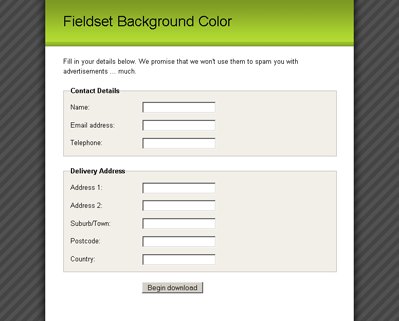 If you put a background-color on a fieldset with a legend, as in Figure 14, you can see the problem all too clearly. The fieldset on the left shows how most browsers render a legend and fieldset with a background color. The fieldset on the right shows how Internet Explorer renders it — the background-color of the fieldset appears to extend beyond its border, stretching to fit the height of the legend. This statement includes a style sheet for Internet Explorer 7 and earlier, as these are the versions that currently display this deviant behavior. Any other browsers will ignore it. We could use a style sheet that applies to any version of Internet Explorer — including those released in the future — but the legend display difference may be corrected by then, so it’s safest just to apply it to the versions we know for the present. In this case, the value we’ve given the legend‘s top — 0.75em — just happens to be the right value to get the legend to align with the fieldset. It may vary depending on other styles we might apply to the legend (such as margin and padding). This is quite a robust solution — we’ve used relative units, so if users change the text size in their browsers, the position of the legend will shift accordingly and still line up. In addition to moving the top of the legend, we move it 7px to the left by applying a left value of -7px. This step counters an Internet Explorer quirk — IE always shifts legends to the right by 7px (regardless of text size), so we need to negate that shift to get the legend and the label elements lining up neatly. Because we’re moving the legend up relatively, it will create more space below the legend. To counteract this space, we reduce the padding at the top of the ordered list by an equivalent amount, changing it from the original value of 1em to 0.25em. Without this rule, Internet Explorer produces some weird visual effects around the legend. How weird? You can see exactly how weird in Figure 5.15. We really need to avoid the IE aberrations we’ve seen, but we’re almost there — now we’ll just set the position of the fieldset to relative to restore everything to normal. Now we’ve got fieldset elements with a background color and a legend that lines up neatly with all the other form elements, as in Figure 16. The cut-off of color behind the legend can sometimes look a bit abrupt, as you can see in the magnified view of the legend shown in Figure 17. See Figure 18 — the form looks a lot smoother, no?